While we previously had a quick overview of the new RTX 2080 by Gigabyte by going through the core features that sets itself apart from other manufacturers, we have yet to look into its actual specifications and performance. We will be taking another look at this graphics card to find out just how well it performs. Moreover, since Gigabyte has put in extra effort to designing this graphics card, let’s not put it to waste. We will also be overclocking this card to see just how much better it can perform. As of today, there are 3 main product brands for the RTX graphics cards, namely Windforce OC, Gaming OC and AORUS. 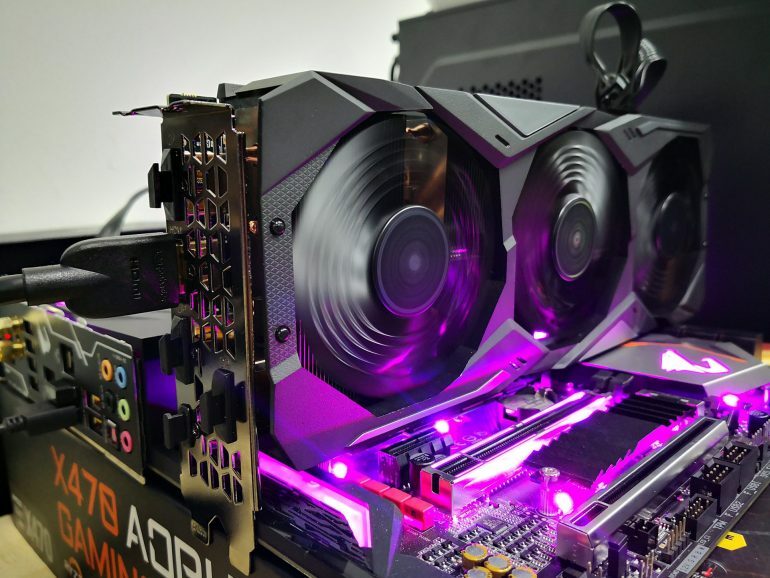 While the AORUS series is reserved exclusively for the top of the line products with the latest and greatest features, the Windforce OC and Gaming OC series are considered more mainstream and wallet friendly variants. While Windforce focuses on providing great cooling features for the graphics card, the Gaming OC promises great gaming experiences. The Gaming OC cards are generally clocked at a higher speed than the Windforce OC cards. Therefore, we can expect better performances on the cards that we have for review. Gigabyte recommends that system builders should have a power supply that is rated 650W and above to be able to comfortably power the GeForce RTX 2080 Gaming OC. This card requires a single 6pin and 8pin power input. A single RTX 2080 is capable of driving up to 4 displays. This also explains why Gigabyte has included 3 x Display ports and 1 x HDMI port for this card. The new RTX series also materializes the New Open Industry Standard for Connecting Next Generation VR Headsets to PCs, Other Devices – VirtualLink which uses the additional USB 3.1 Type-C connector. VirtualLink is built specifically for VR, as it will optimize the latency and bandwidth demands that enables a new generation of VR experience. The highlight of the new GeForce RTX graphics card is mainly about its support for ray-tracing methods to make gaming graphics even more realistic. However, even though it has been more than a month since the announcement of these GeForce RTX graphics cards, there is still a lack of supported games that can utilize the RT core within the Turing architecture. This is the same for DLSS as well. Game developers have to play catch-up to make sure that their games will work on these new technologies. Regardless, there are progress, as Microsoft just announced their support for DXR (DirectX R), which will work with the Turing based graphics card for accelerated ray-tracing efforts. With the resources available, we can only measure and compare the traditional rasterization methods for rendering of gaming graphics. We will compare the GeForce RTX 2080 we have on hand with a Pascal based GTX 1070, and see how much NVIDIA has progressed over the years. Also, we will find out how much more we can push this specially-designed Gigabyte GeForce RTX 2080 Gaming OC 8G in terms of overclocking, and how much improvement the overclocked settings can bring. We want to find out if the RTX 2080 is able to run games at their highest possible settings in 1080p resolution. While most gaming reviews are based on Intel’s latest processors, we will also try to be different, and use AMD Ryzen platform instead. We understand that there could be performance differences when compared to Intel setups, but this should also reflect the actual performance you will get when you have your RTX 2080 on a Ryzen based system. Furthermore, we will also find out the cooling performance and noise from the fans of the Gigabyte GeForce RTX 2080 Gaming OC graphics card. It should be interesting to see how much cooler these new 12nm GPUs can run. Since the Gigabyte GeForce RTX 2080 Gaming OC already comes with a factory overclock at 1830MHz, we will continue our tests with this setting. It can actually be configured with the “AORUS Engine” software that can be downloaded from the manufacturer’s website. Depending on the use case, you can select the most appropriate profile for your own use. Gigabyte has included the AORUS Engine utility which is used to control the configurations of the graphics card. Specifically for the GeForce RTX 2080 Gaming OC, there are 3 presets mode available, namely the OC Mode, Gaming Mode and Silent Mode. As this graphics card is factory overclocked, it runs 1830MHz in OC mode right out of the box. With the AORUS Engine utility, you will be able to set it to Gaming Mode, which runs at 1815MHz. Honestly speaker, there won’t be much difference between these two modes, so you would might as well leave it in OC mode. While this OC profile selection mode is rather simple to use, more advanced users can tap onto the Professional Mode, which allow them to manually change the core clock and memory frequency of the graphics card. Users who knows what they are doing can also change the voltage settings of the card here. Interestingly, there is also an “Autoscan” feature that allows intelligent tests to figure out the overclocking capabilities of the graphics card. By increasing the voltage, it determines the maximum overclock that the graphics card can sustain. Based on our test, with a voltage of 1.1V, we should be able to get a overclock of about 2000MHz. Sadly, the user interface of the software is rather unfriendly, as it does not tell us the actual clock frequencies and voltages that are tested. We have to estimate directly based on the graph to make a guess. With this information, we managed to push our RTX 2080 to 1932MHz on the core clock and 16000MHz on the memory clock. This was using the overclocked profile for the comparison to the factory overclocked card’s performance. Just simply based on the synthetic tests done with 3DMark’s FireStrike and TimeSpy, we definitely saw the real raw increase in performance between the Pascal based GTX 1070 and the current generation Turing RTX 2080. In fact, the results seem to show that the RTX 2080 is almost two times faster than the GTX 1070! We also saw that by overclocking the RTX2080 Gaming OC, we were able to effectively yield a much higher score than the baseline setup. This means that the RTX 2080 Gaming OC scales very well to the increase in GPU Clock and Memory frequencies. Moving on to the games, we do see similar trends. However, there were some exceptions. In Total War: WARHAMMER, which is a CPU intensive game, we saw that the results were similar across the board, regardless of graphics cards and configuration used. This is likely caused by the limitations of the Ryzen 7 CPU, which bottlenecks the game at this frame rate. The new RTX 2080 graphics card excels when it comes to For Honor, Deus Ex:Mankind Divided and Assassin’s Creed Odyssey as the increase in framerate was very significant. With the AORUS Engine software, we were able to configure the fan curve of the RTX 2080. It is also because that the graphics card itself performs so cool, the fans on this card rarely spins at all. When in games, it rarely reaches 50% of its fan speed. By default, the fans will only kick in when the temperature is 58 degree Celsius and above. To understand the heat dissipation performance of the cooling system on the Gigabyte GeForce RTX 2080 Gaming OC, we had to manually set the fan speeds. The setup was placed in an air-conditioned room controlled at 24 degrees Celsius. To our surprise, this card really runs extremely cool. In idle situations, the GPU core temperatures were only a mere 27 degree Celsius. While many other graphics cards will suffer when it comes to Furmark stress tests, the RTX 2080 smothers it. It seems that Furmark’s stress test was insignificant as a load to the graphics card, as its temperatures was well tamed. The environment that we were in had a noise level of 45 dBA (which is largely caused by the stock CPU fan). With all the baseline information stated above, here are the results of the noise and temperature tests on the Gigabyte GeForce RTX 2080 Gaming OC. Based on the speed and noise results stated above, we can infer that the Gigabyte GeForce RTX 2080 Gaming OC graphics card’s performance is outstanding. A GPU that is manufactured on the 12nm node really runs cool! Even though the graphics card turns off its fans when on idle, it was still able to maintain a cool temperature of 31 degree Celsius on idle. The highest temperature we’ve seen on this card was just 66 degree Celsius on Furmark. This also means that this graphics card can be potentially overclocked to a much higher speed if the software allowed a higher voltage setting. Gamers who are purchasing the new Gigabyte GeForce RTX 2080 Gaming OC need not worry about noise at all, as the card performs silently. Even with the factory settings, the fan speed rarely goes beyond 55%. However, do take note that we are testing this system on an open bench, and the room is air-conditioned. The situation may be different if your graphics card is placed within a computer case. Regardless, as compared to other graphics cards which we have tested previously, this is one of the coolest one yet. Can the Gigabyte GeForce RTX 2080 Gaming OC play games at the highest possible settings at 1080p resolution? Yes. There is no doubt that it will be able to handle the games at this resolution. The games that we have tested showed that this graphics card can provide frame rates above 60FPS (or at least very near) at the highest settings. While performance is a given for the GeForce RTX 2080 Gaming OC Graphics card from Gigabyte, the company’s effort in making sure that it stays cool and quiet is really commendable. These are the small details that could affect the overall gaming experience as well. Moreover, by having an efficient cooling system, this card was able to overclock well to even higher speeds, despite the fact that it is already factory overclocked. This allowed games to perform even better than it usually would. If you are looking for a new RTX 2080 graphics card to power your latest games, do take a look at the Gigabyte GeForce RTX 2080 Gaming OC. I’m pretty sure that it’s cooling performance will “blow you away”. Assassin’s Creed Odyssey lets you have a pet wolf!